Such a list is not easy to compile, and it is even harder to be objective. The way I reduced 830 F1 drivers to 20 is detailed in Part I. I wanted twenty top drivers (top No.2’s who might have been a team leader.) who had proved their ability to win – not drivers who showed talent but were unable to realise their potential, including drivers whose career was brought to an untimely end, for whatever reason. GP drivers in a Canadian F.Atlantic race and Hunt pointed him out to McLaren. He was 29 when he was offered a five-race F1 deal with McLaren at the 1977 British GP – but apparently Teddy Mayer felt Villeneuve “was looking as though he might be a bit expensive” and, despite qualifying ninth in the previous year’s car, nothing more came of it… But he was invited to Maranello where apparently Enzo was reminded of the great Tazio Nuvolari and signed him up, from the last two races of 1977… Apart from that one-off McLaren drive Villeneuve only drove for Ferrari throughout his tragically shortened career. per hour. Those things used to slide a lot, which taught me a great deal about control. And the visibility was terrible! Unless you were leading, you could see nothing, with all the snow blowing about. Good for the reactions — and it stopped me having any worries about racing in the rain.” Maybe he should have worried a little more, but he was certainly fearless. Villeneuve replaced Niki Lauda, who left Ferrari before the end of the season after some disgruntlement, but had a sad start to his career in the final event in Japan where he banged wheels with Ronnie Peterson’s Tyrrell, and took off… and landed on a group of spectators, who were in a prohibited area. One spectator and a marshal were killed, and ten people were injured. An investigation decided not to apportion any blame. Villeneuve’s first full F1 season began with an eighth place in Argentina (plus fastest lap), followed by four retirements, the fourth at Long Beach, where Villeneuve had qualified second, and led for much of the race, until colliding with a back-marker and retiring… and then taking a fourth place at Monaco. After a string of further disappointments Villeneuve gained his first podium in Austria and then winning the final race in Canada – still the only Canadian to have won ‘at home’. However his teammate, Carlos Reutemann, won four times, to finish third in the Championship – there was more to come from Villeneuve. At Monza the tifosi were overjoyed to see Villeneuve take his second front-row start of the year, and he also finished second in the race, but he and Andretti jumped the start and were penalised one minute, leaving them sixth and seventh. There were many incidents in the race, which was red-flagged as a result of Peterson’s crash, and it was about to be restarted, three hours late, when Jody Scheckter’s Wolf lost a lap on the formation lap, and flattened the guard-rail. A deputation of drivers examined the area, and asked for adjustments, and a much shortened race started at 6 PM, four hours late. While Reutemann took the vacant seat at Lotus, Villeneuve was joined by Scheckter. It was Ferrari’s year, at least until Alan Jones’ Williams came good in the second half and won four out of five races. The record shows Scheckter took the Championship with Villeneuve second, four points down: they each had three victories, and three second places. Villeneuve had an additional second place that had to be dropped, while Scheckter had four fourth places, two of which were dropped. [NB: at that time only the best 4 results from the first 7 races, and the best 4 results from the last 8 races counted towards the Drivers’ Championship…] Both drivers had one pole position but Villeneuve was the only one to score fastest laps – six of them. In Italy Villeneuve could have gone on to win the Championship by beating Scheckter… but allegedly chose to finish second, less than a second behind, ending his own championship challenge. Although Scheckter was ahead in the Championship Villeneuve was still in contention. He qualified fifth to Scheckter’s third and ran right behind Scheckter’s gearbox throughout the race… Was he on team orders to let Scheckter win if Scheckter was ahead, was he being a gentleman, or was Scheckter simply the faster man on this occasion. At no time during the race was Villeneuve seen trying to pull alongside, or even pulling out of the slipstream to take a look. His behaviour throughout was of the dutiful No.2 driver, reminiscent of Moss to Fangio, Peterson to Andretti, and many others… and yet Gilles Villeneuve was nobody’s stooge. Did he run so consistently close to demonstrate he could have taken the lead…? Whatever, it was extremely uncharacteristic for a man who was never slow to put his car’s nose ahead… and keep it there… to apparently accept second best on this occasion. During the year, when they both finished without a problem, Villeneuve beat Scheckter 6:4. I have no desire to denigrate Scheckter’s Championship – I just find Villeneuve’s behaviour unusual. Unless it was a Ferrari decision. In Canada Villeneuve qualified second, between the two all-conquering Williams cars, while Scheckter languished in ninth. Villeneuve jumped into the lead and held off Jones for fifty laps before having to give best to Williams, though he held on to second from a really hard-pushing Regazzoni. Finally to Watkins Glen. The record book shows Villeneuve won, in wet conditions… but he was 48 seconds ahead of Arnoux… after Jones had crashed, from an ill-fitted wheel. Twenty minutes before the race started it was raining again. Villeneuve jumped ahead and after two laps was five seconds ahead but, as the track began to dry, Jones closed in and went ahead on lap 31. Villeneuve pitted for slicks but, when Jones did the same, one wheel wasn’t properly fitted… and he was soon out of the race, leaving Villeneuve almost a full lap ahead of Scheckter, who later lost a tyre. Villeneuve cruised home, with fading oil- pressure, 48 secs. ahead of Arnoux. 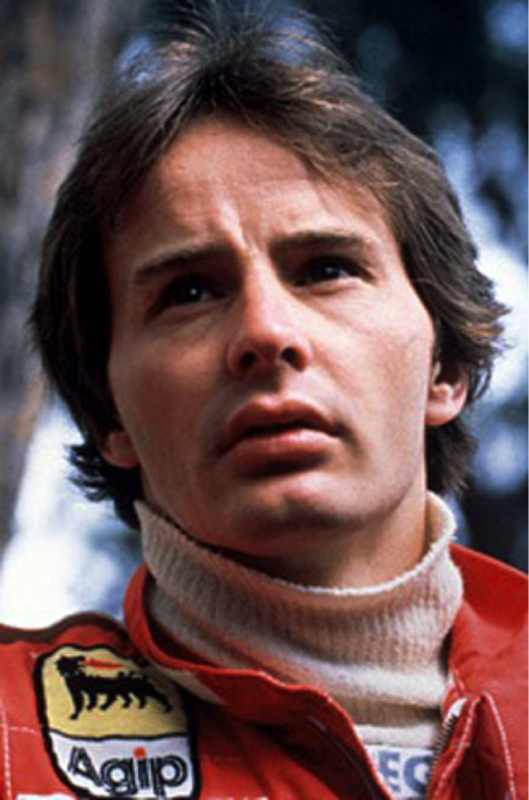 1979 turned out to be Villeneuve’s best year – he would not even get close to winning the championship again. Scheckter decided to call it a day and Villeneuve was joined by newcomer, Pironi, to drive Ferrari’s first turbo car which had considerable power and straight-line speed, but turbo-lag and handling problems prevented a challenge for the Constructors Championship, eventually finishing fifth. Nevertheless Villeneuve scored an amazing victory at the slow Monaco circuit and, at Jarama, he held back five faster cars who were able to close up on the corners before Villeneuve roared away on the straights. He also took pole position and fastest lap at Imola. In the penultimate race at Ile Notre Dame, which would be renamed, Curcuit Gilles Villeneuve, the following year, Gilles drove with a seriously damaged front wing for much of the race, probably obscuring much of his forward vision, and in heavy rain… but I expect he thought it was nothing compared to his snowmobile days. Nevertheless he should have been black-flagged but after several frightening laps the wing became disconnected, and Ferrari left him to decide. I say this because the wing could have easily caused a death if it had hit anyone when it let go, and even the debris could have had severe repercussions. As with the missing wheel in 1979, Villeneuve drove without apparent concern for what could have happened behind him. Now came disaster, with which I have already dealt in Part-17, and covered the incidents in greater detail in my earlier series of the complete 1982 Season [Starts here…] I don’t enjoy writing of tragedies, and the loss of Villeneuve in a practice accident was, and still is, a tragedy. Many people have attempted to ‘explain’ the incident – most have a highly subjective opinion. All we know for certain is that Villeneuve came across another, slower- moving, car, both drivers took evasive action, but failed to avoid a collision, and the Ferrari took off. Villeneuve, still strapped to his seat, was thrown from the disintegrating vehicle and died in hospital that evening. Gilles Villeneuve was especially noted for his exuberance, even devil-may-care approach to racing. Certainly he so often put his car where a lesser man (i.e. almost all other drivers) would not have dared, and his impeccable car control enabled him to pull it off… but.. in his final performance even Villeneuve’s skill proved insufficient to get himself out of trouble. I’d say this will be the controversial one ;-). Personally it gives me great hope that moss won’t be top of the tree! Its getting near squeeky bum time….. Whaaaaat!!! L’Aviateur not in the top 3!? Poor Carlo will find red rums head in his bed. Sorry, Carlo is in the clear….its BJ that’s in trouble. Got the authors mixed up. Carlo, you can come out of the safehouse now! Lol, my equine business is robust. Great, got a head to spare? Damn garagistas, these people have no respect whatsoever ! I deserve all the slagging my friends! BJF, I wanted to add a little information for the article regards the 1-2 at Monza. The points system that year was the best four results from both the first half of the season and the second half. Scheckter winning at Monza would secure the title, Villeneuve would have had to win the last three races. JS qualified 3rd and GV 5th, by the time they assumed 1st and 2nd position JS was ahead and team orders meant they maintained position. Enzo Ferrari said Pironi did not interpret the pit signals correctly and understood Villeneuve’s disappointment and agreed with him. Sorry BJF, Enzo Ferrari agreed with Villeneuve. Was schekter ever asked the question about Villeneuve holding station at monza? I always wondered how Villeneuve would have fared in 1983 as well, after the GE era. Ferrari won the WCC that year, with Tambay then Arnoux scoring the lead driver points.. so perhaps Gilles could have taken it to Prost and Piquet. By 1985 and Alboreto’s title attempt, we can assume he might have retired and made way for the next young Italian. But for things going a little differently, GV could be a three time champion – 1979, 1982, 1983. It’s fair to say that with the impression he left in the sport, he is pretty much held in the same esteem as those lauded for taking 3x WDCs. Something that could also be afforded to Moss.. so it will be interesting to see where Moss appears in the list! Mmm, Gilles only number 8? I wonder what your all-time list (incl. champions) would have looked like, bet some eyebrows would have been raised! I think this is, more or less, the correct area for Gilles V. Any higher would be too romantic in my humble (and sometimes belligerent) opinion. Actually BJF, so far you have been really spot on for all drivers, even Webber :). I’d do a slightly different order of course, but they are all in the right area. My only qualm I think is DC. I have already mentioned I thought he’d be a good few places higher. And now I have this sick feeling in my stomach building that Eddie Irvine is going to be put in the top end of this list. I was hoping he would have been mentioned in the late teens at best, if not at all. I sense the true controversy of this series is about to hit as we get closer to the top end. Fast Eddie. Legend of a man! Being one of most celebrated best drivers among the non-champions, surely I was expecting Giles a bit further up in the list. I thing the charm of Devil-May-Care, and the enthusiasm of pushing to the limit as well as spells of car control make people to think that he was a champion, if not in the real world, but in their heart, there is a sub-conscious gesture in mind that he sits among the hall of fame of motorsport. He is still also one of the most coveted “What if” stories of F1. Though I am a bit disappointed to see Giles at No.8 , but certainly applaud the author for trying to get a ranking of something that will always be debated, argued and never agreed among all. Thought Gilles deserved better than 8th on this list. I was fortunate to see Gilles race in FA , before I saw him race F1. Even in his early days , his raw pace and car control was breath taking !! I was at Watkins Glen in 1979 . His performance that weekend in the rain , was surreal , legendary status confirmed !! He really was on a different plane then the other drivers. Totally committed , fearless , MAXIMUM Attack , every lap !! To be honest, crashers are not the good material for champion. Gilles was funny and spectacular but he was NOT the master driver. He was good to watch but he used to make too much mistakes. Especially taking corners. He was fast with fast cars and he was slow with slow cars. He did not miracles with slower cars, like, f.e. Keke Rosberg. And Gilles was pure ground effect star. Without it — he would have been pretty helpless. Without The Last Laps Of FRANCE 1979, I Doubt I Would Regard F1 The Way I Do.